My friend N'Gai Croal and I have made a game out of choosing the 10 best video games of all time. This is a game, called Canon Fodder, that we invite game developers to play every six months or so. Earlier this month, during Canon Fodder season two, The Legend of Zelda: The Ocarina of Time got knocked off the No. 1 spot. 1) It excluded games that were popular before games were reviewed online. N'Gai and I then invited game developers to each make one of two moves. They could 1) swap the positions of any two games on the list or 2) remove any game and replace it with a new game in that removed game's spot. We had 10 people from the games industry take turns before we showed the results to the public at the Penny Arcade Expo East in Boston. Peter Molyneux (Fable), Patrice Desilets (Assassin's Creed), Curt Schilling (yes, the ex-pitcher), people from That Game Company (Flower), and 5th Cell (Scribblenauts) all took their turns. Then, at PAX East, a bunch of developers took turns live. The result, after 13 turns…. That was the list as of March. Not good enough! We intended to once again "record" a bunch of turns made by professional game creators in advance of a public unveiling of the moves at this month's Penny Arcade Expo in Seattle earlier this month. In August, I took a printed version of the Season 1 Finale list to Quakecon in Dallas, Texas and I began to look for developers to make some moves. Quakecon is a convention built around id Software, the studio behind Doom. Its main feature is a cavernous Bring Your Own Computer area that, for three days, pretty much houses hundreds of gamers who have trucked and wheelbarrowed in their gaming rigs so they can compete in local video game shootouts. Quakecon is PC territory. Look again at that season one finale list. Did you really think it would warm the heart of game creators at a place like Quakecon. Radical changes were made, all of which N'Gai and I then revealed to a crowd during our PAX panel, Canon Fodder Season Two. Explanation: At a Quakecon party, Howard told me that Civilization was too important not to be on the list. Why the first one? He prefers to commend originators, games that establish a successful blueprint. Reaction: The PAX crowd freaked out at the removal of Chrono Trigger, but the insertion of Civilization was an undeniably solid move. Gamers did not riot. Explanation: Doom is the best game, Harvey had told me at Quakecon. I double-checked with him that he wasn't just saying this because we were at Quakecon. Nope! It's gotta be number one, he said. UPDATE: Given how controversial this move is with our readers, I'm tossing in a little more Smith had to say in support of Doom via Twitter shortly after this article was published: "Like Pac*Man, Doom had perfect mechanics, but further coupled them with revolutionary visuals and sound; deeply psychological." Reaction: The crowd at PAX hated this move. This is the PAX-Quakecon divide. Doom is inarguably a huge game in the history of the medium, but few of our audience members at PAX seemed to be at peace with Smith's move, which, based on the rules of the game, had to strike Ocarina off the list in order for Doom to be introduced as Numero Uno. Explanation: Rhinehart made his move before he and I were on a Quakecon panel together. He chose to do a swap, which hasn't been executed by many of the people playing the game. He told me that Tetris is the best game of all time, but he wasn't ready to move it into the top position. Instead, he swapped with Portal because he said the acclaimed Valve first-person shooter/puzzle-game felt too new and too slight to rank high on the list. Reaction: The PAX crowd — and three developers N'Gai and I had on stage with us — were more or less fine with this move. There was some fretting over Portal being dropped low, but there was also agreement that newer games might not deserve to be on the list yet. Portal had been released in 2008. The second-newest game on the list, World of Warcraft, was released in 2004. Most of these games weren't even out in this decade. Explanation: Few of the designers I spoke to at Quakecon made strong cases about why they removed the games they did. They focused on what they added and why. Pagliarulo, for example, argued that Thief was "the progenitor of the stealth genre." He said the world wouldn't have Splinter Cell without Thief, for example. Reaction: Super Metroid was removed. How do you think the PAX crowd reacted? Explanation: Colantonio pushed for Ultima Underworld, because, well, "it's great." He actually did make an argument about the game he removed, saying that, with Thief now on the list, it didn't make sense to have later stealth game Metal Gear Solid up there. Reaction: It was about this time that we all realized that console games had almost been completely removed from the list by the Quakecon developers. The PAX crowd was uneasy. Explanation: West, who I cornered at Quakecon, said Thief "had awesome promise but didn't deliver." Street Fighter I, however, he said, popularized the fighting genre and revived the arcade scene. Reaction: As one of the main people behind Call of Duty and Modern Warfare games, West is a proven crowd-pleaser. His move here thrilled the audience. Explanation: Alderman said he went for Grand Theft Auto for the same reason West chose Street Fighter. It started a craze. He chose Vice City because he said that, of all the GTAs it had the best setting. Portal was too small scale, he argued, to be on this list over a GTA. Explanation: None of our early turn-takers knew which moves were made before them. So Swift didn't know that Portal, a game she helped lead the design on, was removed just before her turn. Might it have changed her move? She took her turn over e-mail and, in part, explained why, of all Zeldas, she chose Link to the Past: "I absolutely loved playing A Link to the Past and for me personally, made me fall in love with games and made me want to make video games for a living. 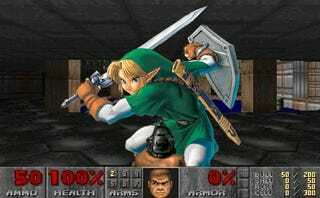 I think A Link to the Past took adventure games to a whole new level with lots of areas to explore, fun skills to learn, an interesting story, enjoyable artwork and a memorable soundtrack." Reaction: Zelda was back. A console game was bumping off a PC game. PAX people loved that. Explanation: Wedgwood had sent a lengthy explanation that began with: "Because Doom is in the list, I don't think there's a need for a second purely single-player shooter" and culminated with "I'm cheating by swapping Half Life for Half Life: Counterstrike, and thereby including both. Counterstrike had existed in other guises and on other game platforms before, but Half Life: Counterstrike was the first game to capture the consciousness of an audience that thought that playing games wasn't cool, and better yet, those non-gamers that were attracted to online teamplay by their friends, found themselves experiencing Half Life's incredible single-player narrative when the servers were empty…"
Reaction: We had two designers on stage at PAX who were going to take their turns live. They couldn't prepare in advance, because the list was changing before their eyes as we went through all those Quakecon and e-mailed moves. But both of them said that Wedgwood's move was the move they were going to make. They were going to have to scramble to come up with something new. "The Legend of Zelda is a big title to remove. Listing the 1991 SNES edition of that game (instead of the 1986 original, or the Ocarina of Time that once graced this list) is already a bold move, and I can't deny that it added fundamentals to the series and to the action adventure genre. "But *any* Zelda title must first pledge fealty to Warren Robinett's masterpiece for the Atari VCS. "Adventure is the origin of the graphical adventure game. Through adaptation, it superseded Colossal Cave and the entire text adventure genre, making the graphical or action-adventure king at a time when adventure games had to be played on PDP minicomputers (and before Infocom had even been founded). Adventure taught us how to walk off one side of the screen to appear on the opposite edge of a continuous space. Adventure originated the collide to pick up and / use logic of items that founds every graphical adventure game that follows it. Adventure gave us the original visual rendition of the disorienting labyrinth. Adventure gave us a prototype of the avatar, using the Atari's 'ball' graphic to represent 'you'-where 'you' meant any of us. Adventure began the turn away from arcade-style home console games and toward longer games with plots and purpose. Adventure deserves a spot with Doom and Super Mario 64, for like those games it invented an entire genre." Reaction: Again, Zelda was removed. This makes PAX people mad. N'Gai and I designed this game with the intent to have it be played by people who are professionally involved in the creation of games. We invite game designers to make moves. Executives might be ok. But, sorry, regular gamers, we're not asking you to make official moves. We did, however, ask PAX attendees to suggest moves. We had two game designers on stage who were about to make their moves live and we told the crowd that they could do their best to influence them. Explanation: Griesemer had to make this move live on stage at PAX. He had wanted to make the move that Wedgwood did and struggled to come up with a new move on the spot. He decided to cut StarCraft because he said it felt like it "operates on a bizarre middle ground between Civ and Diablo." He said he wanted the list to be representative and that it needed a side-scroller. So he went with Mega Man 2 . Reaction: Mixed reaction, leaning toward positive. PAX attendees like their Mega Man. Explanation: Hecker credited the crowd suggestion of Beatmania for inspiring him to add a music game. He called for DDR to be added to the list. Hecker said Bogost's move was just his friend Ian playing to the academic crowd. DDR, he said, "is the best rhythm game… it's the Counter-Strike of rhythm games." Reaction: This move perplexed the crowd, an odd final twist to Season Two. What do you think of that list, huh? Perfect? Of course not. Canon Fodder will return, maybe at PAX East in 2011. For now, stew on that Season Two finale list and decide whether you can live with Zelda games being repeatedly knocked off the top 10.